Invest in the pleasures of outdoor living with Leisure Decking. From sunbathing to entertaining, decks improve the value, aesthetics and quality of life that a home affords. Take advantage of the beauty of your property and the splendours of the Australian weather by adding a deck to your home today. At Leisure Decking, our team of decking specialists and professional carpenters will create the perfect deck for your home. Perhaps you have a particular vision for what you want regarding size, design and wood colour. Maybe you would prefer to get our opinion on what type of deck would suit your property best. These characteristics have allowed us to cultivate lasting relationships with our clients and accumulate a profound and versatile portfolio of work. Check out our gallery page to see some of the projects we have undertaken in recent years. 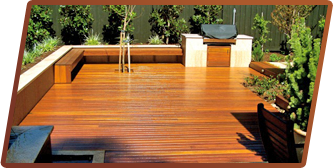 Leisure Decking Melbourne also provides a full deck maintenance service. From jet washing to oiling to more extensive deck repairs, our decking specialists in Melbourne will be there to keep your deck looking perfect—even years after construction. Are you interested in working with Leisure Decking Outdoor Living? Call Stephen on 0408 565 561 to ask any questions you may have about our services. We can give you advice on your deck, tell you the difference between timber decking and composite decking or walk you through our maintenance services. We also offer free, zero obligation price quotes to all customers. Leisure Decking always appreciates the testimonials we get from happy clients who take the time to express their gratitude. These come in the traditional forms like cards and letters, email, and especially verbal, but we also get them by text message, Facebook and other social media. Please allow me the opportunity of thanking you and your team for the exceptional experience you provided during our recent deck project. Home improvement projects are stressful enough but Leisure Decking exceeded all of my expectations by making our deck installation virtually stress-free. It was a pleasure to work with you and your crew on our project. They were all very professional, polite, responsive and thorough in their work. In summary, your strong commitment to doing the very best job possible left me with the impression they approached the project in the same manner they would if they were working on their own home. It would be my honour to serve as a reference to anyone thinking of contracting with your company. My compliments and thank you for a job well done. I look forward to working with you on future projects! Just to let you know that I am so very pleased with the construction of my deck. Dealing with your establishment has been a pleasure. If any of your Carpenters is ever looking for a job, call me; they were excellent in the communication and made the hole process just easy. To Leisure Decking and the crew, there are not enough words to express my satisfaction. Stephen and and his team were very professional, friendly, and extremely talented in their craft. Without a doubt, any additional work that I have done will definitely be done by Leisure Decking, and be sure I will recommend your company. Again, thank you for doing a fantastic job. Just wanted to let you know we are very pleased with the work that you and your crew did Stephen in replacing our two decks, during the week of Febuary 5th.You estimated 12 days and completed the project on time! The railings are just what we wanted — so our view would not be obstructed, and the decking is just the right color and texture that we were looking for. We look forward to spending a lot of time on our brand new deck. It really enhances our outdoor spaces. Your construction crew was very attentive to detail and the cleanup after the job was perfect. The whole process from our initial meeting, with you Stephen to tweaking the design and final approval was great. 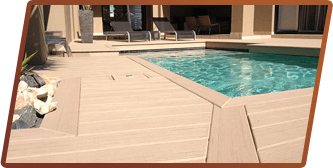 All of our contact with Leisure Decking was very courteous and professional. Please feel free to use us as references, if you like.